Computed tomography scan of the abdomen of a 67-year-old man with a 6-month history of low-back pain. A 67-year-old man presented with a 6-month history of low-back pain despite having sought medical treatment. He had no fever, and his blood pressure was 136/64 mm Hg on admission. His abdomen was flat and soft without any palpable mass. There were no neurologic deficits, and peripheral pulses were normal. Results of initial bloodwork, including a complete blood count and measurement of urea and creatinine levels, were also normal. A radiograph (not shown) and a computed tomography scan of his abdomen showed erosion of his third lumbar vertebra (Figure 1). 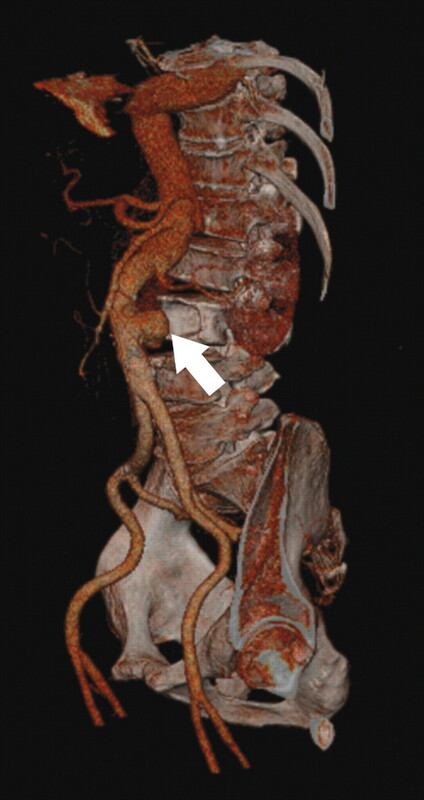 An angiogram revealed an infrarenal abdominal aortic aneurysm 5.2 cm in diameter (Figure 2). During reparative surgery, we found and excised a defect 2 cm in diameter at the posterior wall of the aorta, and we replaced it with a knitted Dacron graft.1 Pathology confirmed a ruptured aortic aneurysm with organized hematoma. Microbial cultures were negative. The patient's back pain resolved once we repaired the aneurysm. Figure 1: Computed tomography scan of the abdomen of a 67-year-old man showing erosion of the third lumbar vertebra (arrow). 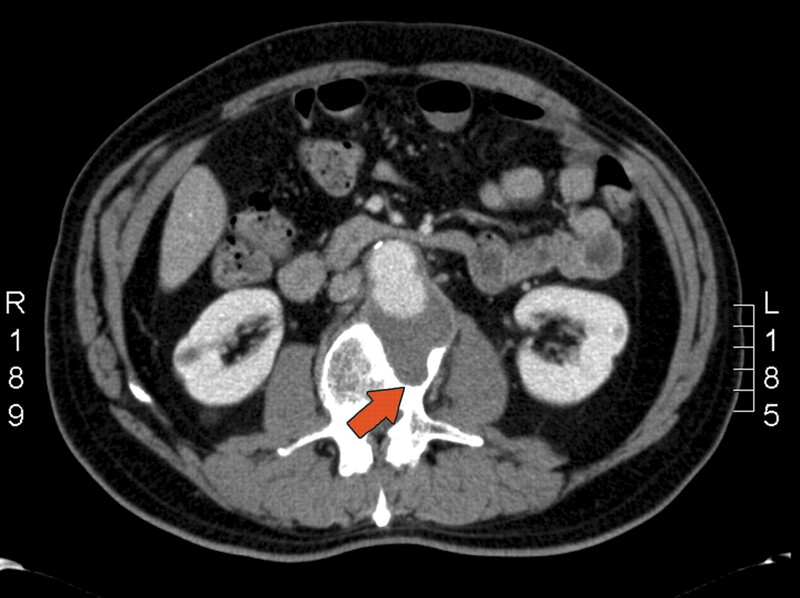 Figure 2: Angiogram revealing an infrarenal abdominal aortic aneurysm 5.2 cm in diameter (arrow). Urgent intervention is necessary because the contained leaks are at high risk for free rupture, with the accompanying high mortality. If detected and repaired, the chronic contained rupture of an aortic aneurysm has a mortality similar to that associated with aortic aneurysms repaired electively. Surgical options include either open or endovascular procedures. Jones CS, Reilly MK, Dalsing MC, et al. Chronic contained rupture of abdominal aortic aneurysms. Arch Surg 1986;121:542-6. Saiki M, Urata Y, Katoh I, et al. Chronic contained rupture of an abdominal aortic aneurysm with vertebra erosion: report of a case. Ann Thorac Cardiovasc Surg 2006;12:300-2. Ando M, Igari T, Yokoyama H, et al. CT features of chronic contained rupture of an abdominal aortic aneurysm. Ann Thorac Cardiovasc Surg 2003;9:274-8.